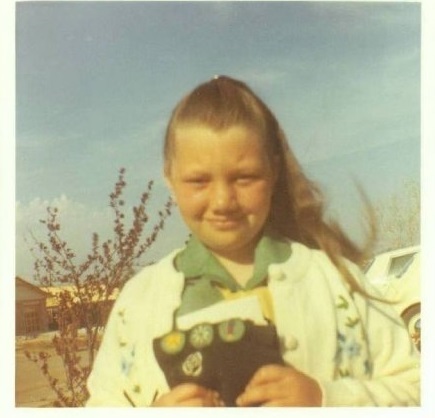 I was an 8-year-old Girl Scout who was fascinated with the Apollo program - like many kids my age. Everything was about the astronauts. We wanted to eat what the astronauts ate, wear what the astronauts wore, etc...everything was leading up to that July night in 1969. I remember my dad getting me up out of bed to watch the landing on TV. I can still see how we were in the living room...I was sitting cross-legged on the floor in front of the TV with my little sister sitting next to me. My dad was in a chair leaning forward with his elbows on his knees. My mom was folding clothes on the couch. You could've heard a pin drop. When we landed, my dad said "Can you believe that?!" The next night I went outside. It was about dusk. I was standing on the sidewalk in front of our little house in a small town in Oklahoma, gazing up at the moon and thinking: "We are up there." Deep down, I wanted to be up there too but thought at the time that girls would never be allowed to go into space. All that didn't matter, I was hooked and have followed our progress in space ever since. I've been to NASA in Houston three times, the Kennedy Space Center once and the Air and Space Museum many times. I never tire of learning more and us exploring more. And it all started with a little girl watching those flickering images from the moon on an old black and white television.